Chips ahoy has teaming up with XBOX to organize the Chips ahoy Xbox Promotion. 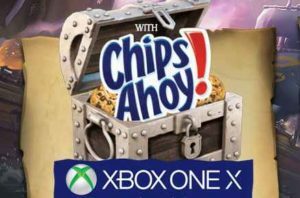 During the promotion period Chips ahoy is giveaway XBOX ONE X gaming console on every pack. The CHIPS AHOY Xbox Sweepstakes begins on May 1st, 2018 until Dec 31, 2018. During the Chips ahoy Xbox Promotion visit any participating retail location and purchase a qualifying, specially-marked package of Chip Ahoy to get the secret codes, Once you have the Chips ahoy game codes now you have to visit www.chipsahoyxbox.com (“Website”), and click on the “ENTER HERE” button on the Website, register (if you haven’t already), and follow the onscreen instructions to enter codes for chances to unlock FREE exclusive Sea of Thieves in-game items and a chance to WIN Xbox One X for free. Make a Qualifying Purchase: Make a purchase of specially-marked package of Chip Ahoy during the sweepstakes period at participating retail location! Original Chocolate Chips Cookies (13 oz. ), Chips Ahoy! Chewy Chocolate Chips (13 oz. ); or Chips Ahoy! Chunky (11.75oz.) to obtain an on-pack code printed on the back of the packaging (each a “Code”). Then visit www.chipsahoyxbox.com (“Website”) and follow the online instruction to enter this sweepstakes. Mail-In Alternate Method: To enter this sweepstakes without making a purchase or entering a Code, hand print your name, address, day and evening phone numbers, email address, and date of birth on a 3″ x 5″ piece of paper and mail it in an envelope with proper postage to“Chips Ahoy! Xbox Promotion,” c/o Hello World, Inc., P.O. Box 5035, Department 835157, Kalamazoo, MI 49003-5035. You will automatically receive one (1) Sweepstakes entry into the applicable Monthly Entry Period drawing. The Chips Ahoy Xbox Sweepstakes begins at 12:00 am ET on May1, 2018 and ends at 11:59 pm ET on December 31, 2018. One Sweepstakes entry, per email address/person, per day regardless of method or combination of methods of entry. Use of any robotic, automatic, programmed or similar entry method or more than the stated number of entries will void your entry/entries and result in disqualification. One hundred (100) Grand Prizes: An Xbox One X (ARV: $500). Four hundred (400) First Prizes : A X Box Controller & Sea of Thieves game (ARV: $120).